As we enter the holiday season we realize that many people in California are without their homes because of the recent California wildfires. 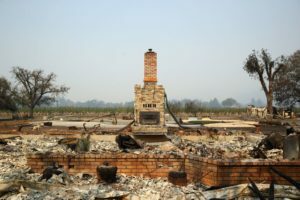 Governor Jerry Brown proclaimed a state of emergency in several counties in California and Insurance Commissioner Dave Jones also declared an emergency in connection with those wildfires. To help insurance companies handle the many claims from the recent California wildfires, the insurance commissioner has allowed unlicensed out of state claims adjusters to assist. While this has helped expedite initial payments to fire victims, sometimes those adjustors have provided incorrect information because they are not familiar with California law. For example, some adjusters have told claimants that they only had 6 months to collect full replacement cost to rebuild. Under California law, no policy may have a time limit of less than 12 months to rebuild and collect replacement cost. Also, because of the state of emergency, the time period can be no less than 24 months. The state has given notice to all claims adjusters, whether licensed or not, who are assigned to wildfire claims that they must be properly trained on the California Unfair Practices Act, Fair Claims Settlement Practices Regulations, and all laws relating to property and casualty insurance claims handling. Some laws are specifically triggered by a declared disaster and impact how claims are paid and the various timeframes for payment of claims. In addition, insurance companies have been advised to take steps to ensure that transactions such as cancellations, non-renewals and other representations made on underwriting issues comply with the laws in place to protect insureds after a total loss or a declared disaster. If you would like a summary of the coverage related laws, please feel free to contact Barbary Insurance Brokerage and we can forward the information provided by the California Department of Insurance.